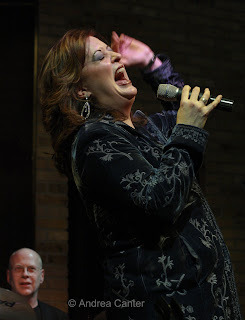 Perhaps expecting a slow Monday night, the Dakota Jazz Club sought to entice customers for the Ann Hampton Callaway show by guaranteeing a refund to anyone who was not satisfied with the performance. It's impossible to imagine that they received any such requests. Callaway managed to upstage herself in Monday night’s first set. The first seventy minutes of pure vocal pleasures with her trio (pianist Ted Rosenthal, bassist Jay Leonhard, drummer Gordy Knudtson) already brought the audience to its feet to acknowledge one of the world’s most effective and dynamic purveyors of the Great American Songbook, one of jazz’s most charming interpreters of popular song from multiple eras. And she’s a great songwriter as well although she did not include any of her own compositions in the first set. But after recounting the tales of love—from its shaky beginnings and ill-fated seductions (the devilish “Comes Love” and the beautiful Stevie Nix "Landslide") to the excitement of discovery (a riveting “Spain”) through the emotional rejoicing of “At Last,” Ann topped off the evening with her signature “in the moment” composition – asking for ten words from the audience from which she would quickly construct and perform a new song. Tonight she was in the mood for love and asked for words to help form a Minnesota love song. Some of our favorite vocabulary provided the foundation for her lyrics—lutefisk, mukluks, tater tots, hot dish, ice fishing, walleye, Lake Calhoun....and in honor of our new President, someone called out “Obama Mamma.” A minute or two of banter later (“stalling for time,” she said), we were treated to both a new composition and Ann’s ample chops on piano, with the added treat of her interplay with bassist Jay Leonhart. Much playfulness surrounded “mukluk” which served as a bass/vocal vamp and brought forth some hilarious efforts at rhyming. ‘Nuff said. 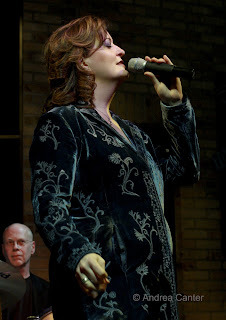 Ann Hampton Callaway’s new CD on Telarc, At Last, is a beautifully presented and sequenced set of “love songs for grownups,” surpassed only by the opportunity to hear her live, when she sings the songs directly to you, piercing your heart or tickling your funny bone, often at the same time. She’s at the Dakota one more night (February 10th). Go. Then buy the CD.